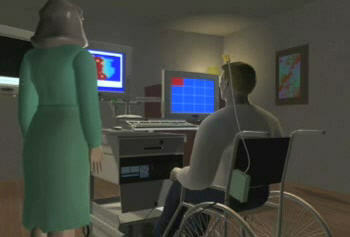 BrainGate, a tiny sensor array implanted in the brain, has allowed a quadriplegic man to check e-mail and play computer games - even manipulate the controls on a television. It is the most sophisticated implant of its kind. 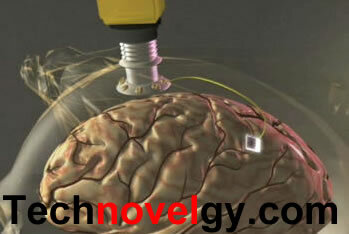 The Cyberkinetics BrainGate contains 100 electrodes, each one tapping into a separate neuron. Placed in the motor cortext, it allows the user to control objects while doing other things at the same time. 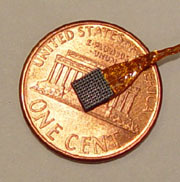 Cyberkinetics has plans to implant the devices in 4 more subjects; the company cautions that BrainGate is an investigational device for clinical testing only. It is not an approved device. As far as I know, the first reference to a machine that is attached to the brain (or placed in proximity to the brain) that will allow a user to control mechanical devices with thought is in Forbidden Planet. 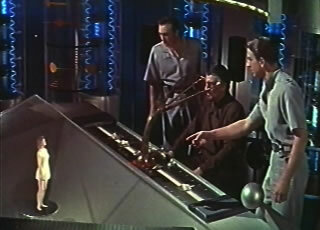 In the picture shown above, Dr. Morbius is able to use the Krell machinery to create a 3D picture of his daughter by thinking about it.